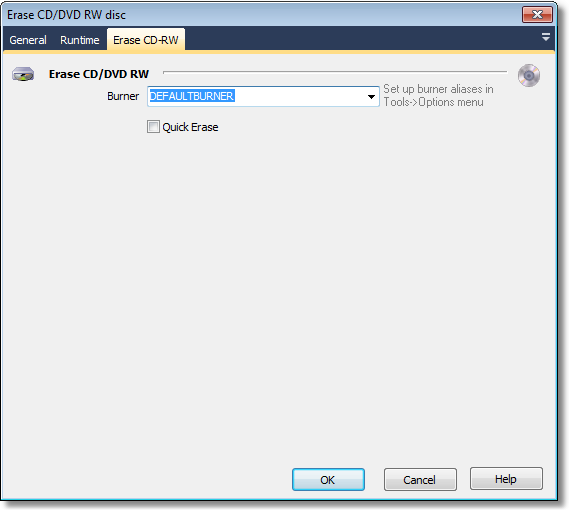 This action allows you to Erase rewritable CD/DVD media (if your burner supports this). Note that to use this action you need to define an alias for your burner first (see here for more info). If your burner does not support rewritable media then it will not appear in the list of burner aliases. Quick Erase is recommended for most media and is substantially faster (full erase can take a long time on a DVDRW! ).